If there’s anything that fills me with delight, it’s the sight of a hillside covered with wild, rock cistus. Back in January, I took you to Furnazinhas in the Algarve hills, and we walked south of there to the reservoir of Odeleite. The cistus were just beginning to open, and I hoped that when I returned to do a second walk from the village they would be more advanced. 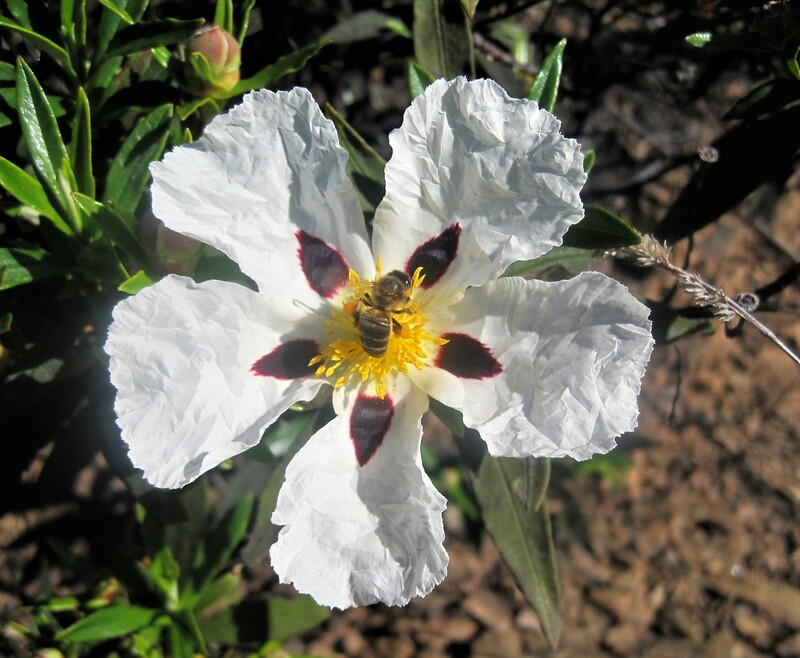 As we drove north from Castro Marim, cistus lined the road. We left the village following the sign PR10 for Barrancos, though as Becky will tell you, nothing is guaranteed when following Portuguese trails. We were forewarned that this might not be straightforward but, with a bit of perseverance, managed to find a way through the overgrown path to confront our first water crossing. A wobble or two and I was across the stones, and feeling triumphant. To be fair, we were lucky, because there has been just one solid, downpouring day in the last couple of months, so following the course of the Beco da Maria Galega was not as tricky as it might have been. In fact, we were surprised at how green and fresh everything looked, with new growth everywhere. We even spotted green lavender! The rockbed was equally fascinating, as Becky describes. I loved the variety of this walk. As I followed the stream, a cottage with a small farmstead peeped through the trees. Down at my feet, flowers cavorted nimbly in the grass and tiny pink stars winked up at me. A frog played lazy hide and seek with the shade. Rounding a bend, I heard the gentle chuckle of water. A waterfall had formed in a deep cleft in the rocks, and I peered into its clear green depths. On the stiller waters nearby, tiny white starlets floated. We had Crocs and a towel with us but, as always happens when you come prepared, we had no need of them. Although we did cross and recross the water any number of times, mostly a hop, skip or even just a stride was more than adequate. 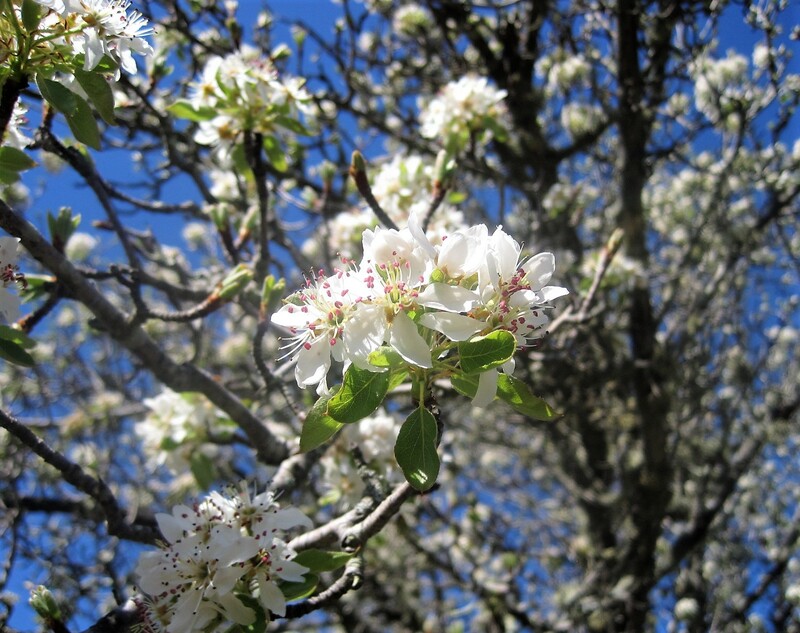 Spring was all around us. As we continued through the valley, two deeply-voiced birds startled us into silence as they called loudly to each other. I’m no birder and didn’t recognise their cry at all, but my husband thought they might be corncrakes. I happened to mention this on Hanna‘s blog, and she very kindly tried to help me identify the bird voices, as you’ll see in her Comments. The trail was easy to follow, but a moment’s indecision arose around 7km. Follow the road, or an interesting path that felt like you were on private property? Hoping not to fall foul of any stray dogs, we chose the second. Tiptoeing around what looked like newly tilled soil, I caught a flicker of pink and white in the long, damp grass. Could they be early wild orchids? The photos are, unfortunately, too blurred to tell. A last flurry of cistus, thankfully no dogs, and we were back in the village where, once again, the cafe was closed. But you’ve been a patient audience so I shall still reward you with cake. It’s only right to celebrate your 1000th post, isn’t it? Water is my element so I loved this walk. I hope you did too. Lots to share again this week. Thank you for your company. It wouldn’t be half so much fun without you. Please visit as many as you can, and join me here next time on Jo’s Monday walk? Heaven’s, Irene! Will this lass ever be free of snow? How about a spot of sunny fishing with Jackie? Talking of exotic, how about this from Natalie? Cathy’s got us all looking up this week! It’s Carnaval week here in the Algarve and celebration is in the air. I hope to bring a little singing and dancing your way. Take care till then! Thanks, darlin! 🙂 🙂 23C this weekend, and I actually spent an afternoon at the beach with a book yesterday. It should, of course, have been a Portuguese text book, but I was slacking. 🙂 After our morning walk I’ll have to do some homework. Hope life’s treating you well. Wow! Congratulations on your 1000th post! Thank you for taking me on another wonderful walk outside. I love the first picture and the waterfalls and bright sunshine. Hugs! On Tuesday we did a hill walk under quite cloudy skies but the cistus were everywhere. Such a fantastic sight 🙂 🙂 Thanks so much! so many signs of spring already and i can’t for it in my part of the world. So much joy in being out in nature at this time of year, LolaWi 🙂 🙂 Thanks so much for your company! 1,000 posts and a beautiful walk, too! What stunning blue skies. It’s no wonder you travel, Sue! 🙂 🙂 But still, there’s no place like home , and this place is definitely starting to feel like mine. Thanks so much! Wow–such beautiful photos, and they depict such a peaceful looking place, then on top of that your description added even more peace to the place!! No wonder I have tired legs, Amy 🙂 🙂 Thanks for your company! No such thing as wrong around here, Sue. You can do whatever you want and I’ll be grateful. 🙂 🙂 Just home from a hill walk and more lovely cistus. On a high 🙂 Thank you! 1000th post? Congratulations! Thank you for another lovely walk, with so much to see! I think I’d definitely feel I needed the reward of a drink and cake after that walk, so how disappointing for you to find the cafe closed. I’ve just been chatting online to the owner of a B&B in the village and we hope to set something up for the future. 🙂 🙂 Apparently the cafe is closed Mondays but it would be open for my Tuesday group of walkers. Thanks, darlin! A 1000 posts?! Wow! Congratulations!! Hi Joanne 🙂 🙂 Not long home from a walk in the hills and the cistus were everywhere! The skies were overcast today but it was still a stunning display. Feeling blessed. 🙂 Thank you! They sound like our trilliums which come out in the spring, and in sunny spots, will completely cover the forest floor. They are rather short-lived so it’s always a thrill to catch them at their height of bloom. Thank you so much Jo for taking us to this wonderful walk.